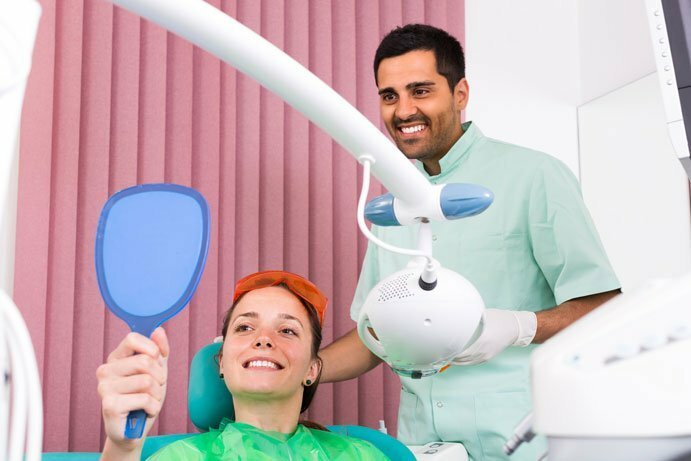 Are you happy with your dental health but dissatisfied with the look of your smile? Do you wish it was whiter or brighter? Carolina Dental Arts is here to help. With our cosmetic dentists in Raleigh, Goldsboro and throughout North Carolina, we can help you achieve and maintain the smile you have always wanted. Studies have shown that making even minor cosmetic enhancements can increase your confidence while lowering stress levels. Talk to our experienced cosmetic dentists today to see what we can do to help you comfortably show off your smile. Nothing makes your smile shine like white teeth! Carolina Dental Arts offers teeth whitening in Raleigh and Goldsboro surrounding areas through Zoom Teeth Whitening. Zoom is a one-hour teeth whitening treatment that has immediate results that last. Most over-the-counter whitening strips work with minimal results, taking months to fully whiten your smile. Our teeth whitening treatments are guaranteed to improve the health of your smile while working comfortably and quickly. At Carolina Dental Arts, we give our patients a positive experience as they strive for dental health, and our cosmetic dentistry procedures in NC are no exception. Our friendly, welcoming team would love to help bring your smile to life through teeth whitening and more. If you would like to learn more about our NC cosmetic dentistry, don’t hesitate to contact us to speak to a member of our staff or one of our cosmetic dentists.